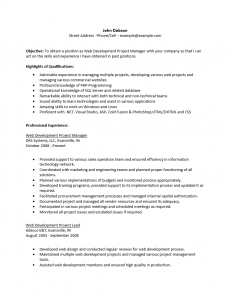 The Web Project Manager Resume Template provides a structural framework for job seekers to deliver their information to recruiters, potential employers, and/or headhunters. The resume is the number one document when it comes time for a hiring entity to decide who will gain an interview and who will not. Ultimately this document has the power to make or break a candidate’s chances of attaining a position so it is natural that a fair amount of effort be made to compose a top notch resume. 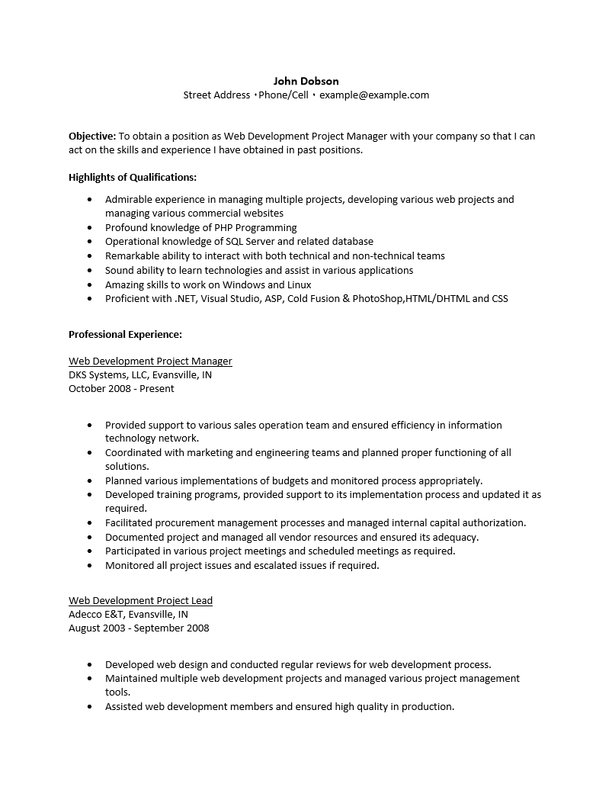 The Web Project Manager Resume Template will free a job seeker from time consuming formatting issues by providing clearly defined areas for different subjects and an attractive eye catching style. Step 1. Input your name at the top of the page then enter your address, phone number and email on the following lines. Ideally, your name and contact information should be centered here and should be no more than three lines. Step 2. The first section to be filled out will be the “Objective” section. This is basically a statement as to why you are sending the resume. Step 3. In the “Highlights and Qualifications” enter a bullet list of your strengths, experiences, and abilities. Step 4. In the “Professional Experience” section, several entries will be necessary. Each entry is reserved for a previous employer and this should be in descending chronological order. The first line of the entry will be the official job title you held. The next two lines will be the employer name/location and dates employed respectively. Each previous employment entry must contain a list of your duties, responsibilities and/or accomplishments while employed with that establishment. Step 5. The “Education Section” is where you will report your academic credentials. Enter the degree you earned and where you earned it.